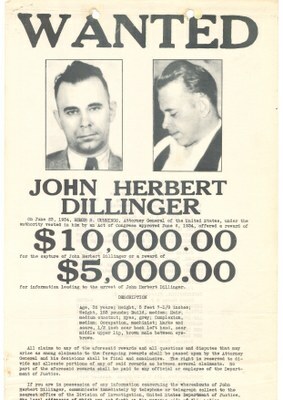 This fall, the Michael J. Colligan History Project enters new territory with Public Enemies: Hamilton’s “Little Chicago” Era & Its Consequences, exploring the underworld of John Dillinger and his contemporaries from a time when Hamilton was legendary for its vice and criminality. We begin with hometown Hamilton between the World Wars. Miami University Hamilton’s own Susan Spellman explores “Business & Ordinary Life in the 1920s and 1930s,” drawing on research from her forthcoming book on business history. Renowned local reporter and crime historian Richard O Jones introduces three classic film noirs in our series “Hollywood Hoods.” Loyola University’s Elliott Gorn puts legendary outlaw John Dillinger on the map of depression-era America, while Jeremy Meier returns to the Colligan, bringing Dillinger to life on stage. Finally, Hamilton’s official historian Jim Blount considers the Little Chicago mystique and the history behind it. (Click below for schedule). We look forward to seeing you all soon. In the meantime, enjoy a very happy holidays!